THE POINT IS: The Apostle Paul lived a most extraordinary life. How did he live such a life? In these verses, Paul declared the source of his living to be Jesus Christ. This is not about imitation, far from it; it’s about a total transformation! That is exactly what had occurred in Paul’s life. Paul said that the reason Christ was so evident in his life was because itactually was Christ; Christ was doing the living through Paul. He had been transformed! According to Paul, the only way for him to live was by means of Christ. Christ is The Life—the one and only life (John 14:6). That is why only Christ can do the living. Living is simply not possible apart from Christ. Existing, yes, but living—no way. Real living is Christ living! THE APPLICATION IS: Are you living or just existing? If you’re allowing Christ to live His life in you, as you, and through you, then you’re living. Otherwise, you’re just existing. As you allow Christ to do the living, He will be magnified in your body: through life, as well as death. When something is magnified, it becomes evident for all to see. You will see the difference and so will everyone else: a positive, constructive, productive difference! 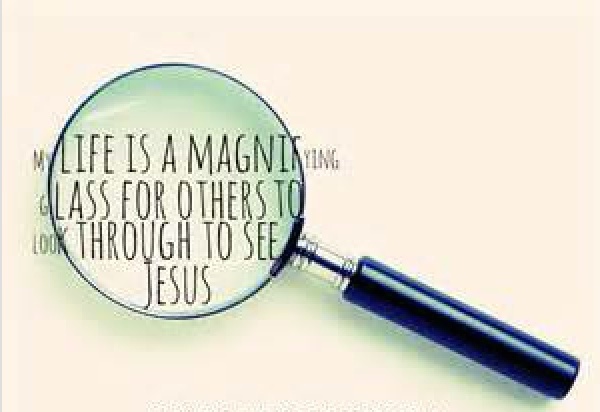 But, you must let Christ do the living and then you will become a magnifying glass for the Lord so that Christ will be evident in everything you say and do. Others will be able to see Christ—His character and His conduct—expressed through you. And the beauty of it is, you get to enjoy His life! Now that’s living . . . living an extraordinary life! The preceding message is provided as a service of Source Ministries © 2015. If you have a comment about this teaching material, would like more information about SOURCE MINISTRIES, or want to be added or removed from this mailing list, please contact us with your name and email address at: source@integrity.com or call 770-979-9804. It is a pleasure to serve you! “Looking Unto Jesus” – powerful, life-giving words! Used as a title of a sermon by Theodore Monod, a Reformed pastor and theologian, Monod was considered the foremost Protestant preacher in 19th-century France. He based his sermon, Looking Unto Jesus, on the verse from Hebrews 12:2. We have been greatly impacted by this truth. Keeping our focus is looking unto Jesus. Do you need refreshing? Do you need new insight? Are you struggling with perseverance or joy in the midst of difficulty? Look unto Jesus. He is the only One who can meet the deep needs of your soul. Trust Him to lift you up and open the way. Sometimes, the answer may not come as you think. Sometimes the answer comes in the form of hardship or loss. But if you keep your focus, persevere in Him, trust Him, He will bring you out on the other side and you will see He has always been making a way for you. And He just may be using the painful circumstance (a blessing in disguise) to bring you what you need, heading you in the direction you need to go that you would not have realized otherwise. There was a young mother who came to us in great distress. She was in a hard place having to leave her husband and find a quiet, safe place for awhile. As we spoke to her and encouraged her through God’s Word and prayer, she left with a renewed heart. She purposed in herself to fully rely upon her Father God. To this day, she remains focused, looking unto Jesus, to give her the support and instruction she needs, and to make His character her pattern for living. She did not immediately know the way she should go but she purposed in her heart to trust her Lord God and He continues to direct her to this day as she leans on Him. May each of us keep our eyes fixed on our Lord no matter what the situations we face, for He alone is able to do what is impossible for us to accomplish. After all, He has promised to be with us in all things at all times in our lives. Keep your eyes fixed – looking unto Jesus. Remember, He will give you what you need when you need it! Let us finish with the words of that Scripture in Hebrews 12: 2b & 3: “who for the joy set before Him endured the cross, scorning its shame, and sat down at the right hand of the throne of God. Consider him who endured such opposition from sinful men, so that YOU will not grow weary and lose heart.” So with great joy, let us fix our eyes on Jesus!